Financial Meltdowns: How Big a Blow? 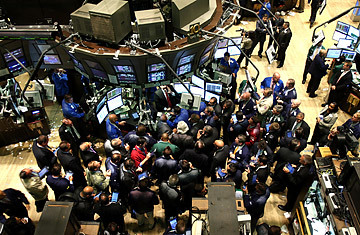 Wall Street's Bomb: What's the Fallout for You? Investing isn't so much buying a stock or a bond or a house, it's about buying into the belief that an asset you purchase for 10 bucks today will be worth more than that sometime in the future. Never mind that the future is generally being promoted by the seller, the way religions pitch their paths to an afterlife. You gotta believe! In investing we fall for it over and over because sometimes it actually works. Stocks do go up. Housing can be an O.K. investment over the long haul. But this time we've been fed not one, but a series of promises that aren't worth the subprime paper they were printed on. First, there's the one about the price of real estate never going down. It got repeated so often that even banks and mortgage lenders who should have known better started to drink their own Kool-Aid and lowered their lending standards. It was a mantra compounded by the hard sell that real estate agents used all over the country: Get in now, because it's going to be more expensive tomorrow. Hope you weren't in Miami or Las Vegas when you heard that. Then there's the nonsense that ratings agencies shoveled out about the risk levels of collaterized debt obligations (CDOs), how this new bit of financial wizardry deserved AAA and AA designations even though it rested partly on a foundation of subprime mortgages. It was all justified by super-sophisticated models  way too sophisticated for "you" to understand  that looked back at real estate pricing and foreclosures and couldn't conjure a scenario in which the holders of the most senior parts of these tranches wouldn't get paid. Perhaps no one figured that subprime mortgage holders were 10 times as likely to enter into foreclosure as people who made downpayments and could document their ability to pay. "This poor performance in the subprime market calls into question the capabilities of lenders, securitizers and investors to reliably estimate peak charge-off rates," warned Joshua Rosner, managing director of Graham Fisher & Co. and Joseph R. Mason, a finance professor at Drexel University in a paper in early 2007. When all the indicators went bad  delinquencies and interest rates up, home prices down  the agencies started yanking the ratings on CDOs by the carload. As the number of subprime delinquencies started to climb, and the magic mark-to-model accounting that the investment houses used to value their AAA and AA CDOs got market-tested  as in, "What will you give me for this piece of paper?"  the game was over. Did you buy the bunk that firms like Lehman and Bear Stearns were serving upabout having adequate capital to cover losses on their unsellable inventories of CDOs? Perhaps you remember when Bear tried to take its pile of garbage, dress it up and dump it wholesale on the suckers in a public offering. That one got laughed off the market. With each writeoff, outfits such as Merrill Lynch tried to tell us that the crisis was over when in fact each writeoff was exacerbating the situation. If they were writing down the value of their subprime related investments and raising capital, then didn't everyone have to do the same? And once that happened, the market for this stuff would get even thinner, requiring a spiral of writedowns. It has become a field day for short sellers, who are picking off the undercapitalized financial outfits one by one. Did you buy the line from by the Treasury Department that bailing out Fannie Mae and Freddie Mac was not a precedent, and that the Federal Government would not be lender of last resort to Wall Street? The public did, but Wall Street didn't. If the bank was open for Bear and Freddie and Fannie, why not Lehman and AIG? It took a high noon showdown over the weekend for Treasury Secretary Hank Paulson  one of Wall Street's own  to convince the Street's gunslingers that he wasn't kidding about the moral hazard issue. And will we believe the next offering that Wall Street will be retailing this week? "It's a buying opportunity!" "It's a short term blip!" A new report by Bernstein Global Wealth management notes that booms and busts often result in "unduly pronounced security mispricing," meaning, we tend to overdo things. Take banks, which were crushed in 1990 by real estate losses. (Sound familiar?) Ultimately, the game reset and bank stocks zoomed 199% through 1996, outpacing the S&P 500. Are we ready to buy into the game again? My guess is yes. We always do.